The twelfth-generation Ford F-Series is a light-duty pickup truck produced by Ford from the 2009 to 2014 model years. On the outside, the design was restricted to evolutionary styling upgrades, with a larger grille and headlights bringing it in line with the styling of the Super Duty trucks; as with many other Ford vehicles of the time, the interior saw the introduction of higher-quality materials in all but the most basic trim levels. Outside of Mexico, the Lincoln Mark LT was discontinued, replaced by the Platinum trim of the F-150. However, this trim line is still sold as the Lincoln Mark LT in Mexico. For the 2010 model year, the SVT Raptor high-performance truck was introduced; unlike its Lightning predecessor, it was a vehicle dedicated to off-road driving. In North America, the twelfth-generation F-150 was produced at the Dearborn Truck plant in Dearborn, Michigan, as well as the Kansas City Assembly plant in Claycomo, Missouri. In December 2014, it was replaced by the thirteenth-generation 2015 F-150, unveiled in January 2014. Ford revealed the 2009 F-150 design at the 2008 North American International Auto Show in Detroit. Development began under chief engineer Matt O'Leary in November 2003 under the code name "P-415", after P-221 production began in June 2003. General design work was done under Patrick Schiavone into late 2005, with further exterior changes taking place during late 2006 to the tailgate design and wheel lip arches during a development hiatus. The final design freeze later took place in early 2007. Production of the series began in August 2008 at Ford's Kansas City Assembly Plant. Ford originally planned to expand the F-Series platform by reintroducing the F-100 as a midsize truck. Known internally as P525, the F-100 would have served as the global replacement for Ford Ranger in 2010 or 2011, The project was ultimately shelved, with the company developing the Ranger T6 as a global midsize truck and in North America, Ford focused on developing fuel-efficient powertrains such as the EcoBoost V6 and the 6-speed automatic transmission for the F-150. The 2009 F-150 featured a larger and more flexible interior, an updated three-bar grille, and additional choices of trim levels. The chassis included lighter-weight, high-strength steel for better fuel economy and safety and improved payload and towing capacity. For the first time in the history of the F-Series, a V8 engine was standard in all models; no 6-cylinder was available. Regular cab models were once again produced with standard-length doors rather than two short, rear-opening doors. All Flareside models in 2009 were made with new badging on the previous generation's boxes and were discontinued at the end of the model year when stock had run out, echoing a similar situation in the first year of the eighth generation. In 2009, the SVT Raptor off-road truck was introduced. Initially available as a Supercab with a unique 5.5-foot box, it was available with either a 320 hp 5.4L V8 or an optional 411 hp 6.2L V8 from the Super Duty line. The standard wheel of FX4 models was enlarged to 18". 2011 marked a major upgrade to the powertrain lineup. In the interest of increasing fuel economy, both versions of the 4.6L V8 and the 5.4L V8 were discontinued. In their place were a 3.7L V6 and a 5.0L V8. Between the two engines was an all-new 3.5L twin-turbocharged V6. Dubbed EcoBoost, the 3.5L V6 produced 365 hp. For 2012, the F-150 sported a ten-grade lineup (XL, STX, XLT, FX2, FX4, Lariat, King Ranch, Platinum, Harley-Davidson and SVT Raptor). For 2013, the F-150 received minor changes such as 3 new grilles (replacing all 4 previous grilles), new optional 18-, 20-, or 22-inch wheels, Sync with MyFord, MyFord Touch navigation system, new power-folding and telescoping trailer tow mirrors (taken from the Super Duty models), high-intensity discharge headlamps, 3 new color options (Blue Jeans Metallic, Kodiak Brown Metallic and Ruby Red Clearcoat Metallic), new Alcantara seats in the FX Appearance Package, black or pecan leather in Platinum, the return of the Limited model and the 6.2-liter V8 being made available in XLT, FX2, and FX4 (SuperCab and SuperCrew only). For 2014, a special truck called the Tremor was introduced, essentially an EcoBoost-equipped FX2 or FX4 truck in a regular cab model with a 6.5' bed, a special FX Appearance Package, a flow-through center console with bucket seats and a 4.10 rear gear final drive ratio. Also new in 2014, the STX trim level also became available on SuperCrew models with the 5.5' box. In addition an STX Sport package was added for 2014 including 20" wheels, black cloth seats, and black exterior accents. Three engines were offered with the 2009 redesign: a revised 5.4 L 3-valve Triton V8 that is E85 capable with an output rating of 320 hp (239 kW) and 395 lb⋅ft (536 N⋅m) of torque, a 292 hp (218 kW) 4.6 L 3-valve V8, and a 248 hp (185 kW) 4.6 L 2-valve V8. The 3-valve 5.4 and 4.6 liter V8s were mated to Ford's new 6R80E 6-speed automatic transmission while the 4R75E 4-speed automatic transmission was carried over for the 2-valve 4.6 L V8. The 4.2 L OHV V6 engine, which had been available, was dropped due to the closure of the Essex engine plant where it was produced. For the 2011 model year, an all-new engine lineup was offered. Two of the engines, a 3.7 L V6 and a 5.0 L V8, both based on the 2011 Ford Mustang engines, both offer E85 flex-fuel capability. The 6.2 L V8 used in the 2011 Ford Super Duty was made available with the F-150 Platinum, Lariat, SVT Raptor, Harley Davidson and "Lariat Limited" Editions (only approximately 3700 made). Finally, the 3.5 L direct-injected twin-turbo EcoBoost V6 was offered in the F-150 starting in early 2011. All engines were paired with a new six-speed automatic transmission (6R80). Electric power-assisted steering was made available on all engines besides the 6.2. Since 2008, the Ford F-150 has towing and hauling capacity of 11,300 lbs and 3,060 lbs, respectively. The 2009 Ford F-150 featured front-seat side impact airbags and Ford's Safety Canopy System for the first and second rows as head protection in the event of a side impact. It also featured Ford's exclusive ADVANCETRAC RSC (Roll Stability Control)--an electronic Stability control and anti-rollover safety feature also available in other Ford vehicles, from the Fusion to the Expedition. The F-150 comes standard with AdvanceTrac Electronic Stability Control, front and rear row side curtain airbags, and front row torso side airbags. Safety Ratings can be found here (https://www.nhtsa.gov/ratings). At the 2008 SEMA show, four 2009 Ford F-150s were unveiled: the F-150 Heavy Duty DEWALT Contractor, the FX-4 by X-Treme Toyz, the F-150 by Street Scene Equipment, and the Hi-Pa Drive F-150. The Heavy Duty DEWALT Contractor was built in a DeWalt theme. The FX-4, also called Fahrenheit F-150, was built for outdoor lifestyle enthusiasts. The Street Scene Equipment version is a lowered truck built with performance and style. The Hi-Pa Drive F-150 was powered by 4 electric in-wheel motors rated over 480 hp (360 kW) and over 375 ft⋅lbf (508 N⋅m) torque combined. The SVT Raptor entered showrooms in late 2009,as a dedicated off-roader, with sales being much better than expected. It was powered by a 5.4 L (330 CID) V8 engine, with the option of a 6.2 L V8. The 5.4 L (330 CID) engine has 310 hp (231 kW) and 365 ft⋅lbf (495 N⋅m) of torque. The 6.2 L (379 CID) engine has 411 hp (306 kW) and 434 ft⋅lbf (588 N⋅m) of torque. The suggested retail price of the 6.2 L model was $3000 over the 5.4 L model. A six-speed automatic came standard. The Raptor features Fox Racing internal bypass shocks with external reservoirs which allows for 11" of suspension travel in front, and 12" in the rear. It comes standard with 35" BFGoodrich All Terrain tires, and a rear Locking differential with a 4.10:1 gear ratio. The Raptor is available in tuxedo black, oxford white, blue flame, and molten orange, with a "digital mud" decal scheme as an option. In April 2011, Ford sold 1,186 Raptors, outselling Honda's Ridgeline. The first production Raptor, molten orange with the digital mud graphic, sold at auction for $130,000 with all proceeds above the MSRP going to charity. The race version, the F-150 SVT Raptor R, was built for the Baja 1000 races. It uses a 6.2 L V8 engine rated at 500 hp (370 kW). For 2011, the SVT Raptor was only offered with a 6.2 L V8. Other notable changes to the 2011 model include availability in a 4-door Super Crew cab and a 5th color option of Ingot Silver Metallic. 2012 Raptors eliminated the open differential in the front end in favor of a Torsen helical gear limited slip differential. Shelby American makes a higher performance version of the SVT Raptor, called the Shelby Raptor. And, the Hennessey Special Vehicles division of Hennessey Performance Engineering makes an SUV version of the SVT Raptor, called the Hennessey VelociRaptor SUV. From the A-pillar forward, the Raptor has a composite hood and fenders that are unique from other F-150s and bereft of the blue oval badge in the grille. SVT widened the track by 7 in (178 mm), so its 5.5-foot (1.7 m) box is unique to the Raptor, as well. The Raptor's height is 2 in (51 mm) over a standard 4-wheel drive Supercrew. It also features new, internal bypass shocks, designed by Fox Racing Shox. The Raptor has new leaf springs and shocks, new front upper- and lower-A-arms, and a wider, thicker-walled rear axle. It is the first Ford with hill-descent control and comes with an electronic differential locker that lets the driver keep it locked at high speeds when the Raptor's Off Road Mode is engaged. Off Road Mode is a feature unique to the Raptor which allows more controlled, aggressive driving while in situations where increased traction and braking are necessary. The Raptor's Off Road Mode allows ABS, AdvanceTrac RSC (roll stability control), and traction control to be completely switched off giving the driver total control over the driving experience. [clarification needed] Off Road Mode also changes the Raptor's throttle sensitivity and transmission shift points causing a more linear power and torque curve for low traction situations. Towing capacity is up to 8,000 pounds (3,629 kg) with a 1,770-pound (803 kg) payload (SuperCrew only). Interior changes include high-bolster seats, a special steering wheel, a redesigned center console, and auxiliary switches connected to pre-wired pass through leads allowing ease of aftermarket product installation. Ford originally promised a value price and a multi-year run—final pricing came in at US$42,000.00 for 2010. In 2014, Chinese company Jiangsu Kawei Automotive released the Kawei K1, which appeared to be nearly identical to the Ford F-150. When interviewed by Fox News in 2014, a Ford spokesman said they were aware of the Kawei and their legal counsel was investigating how best to address the matter. ^ "DETNEWS | WebVideo | 2009 Ford F-150 Platinum". Info.detnews.com. 2008-01-13. Retrieved 2009-04-28. ^ "Freep.com exclusive report: The new F-150 fights to keep its crown". media.freep.com. ^ "Ford's Kansas City Assembly Plant employees celebrate production of NEW 2009 Ford F-150". Media.Ford.com. October 2, 2008. ^ Neff, John (June 2, 2008). "Ford planning F-100 and global Ranger replacement". Autoblog. Retrieved 2009-05-14. ^ Holland, Bob (August 8, 2008). "Ford tables plans for F-100 pickup". Edmunds Inside Line. Retrieved 2009-05-14. ^ Brandon Turkus (Aug 29, 2013). "Entry-level F-150 now offers SuperCrew, Sport Package". Autoblog. Retrieved 2014-09-09. ^ "ALL-NEW FORD F-150 POWERTRAIN LINEUP DELIVERS TOP FUEL ECONOMY, BEST POWER AND CAPABILITY | Ford Motor Company Newsroom". Media.ford.com. 2010-09-20. Retrieved 2010-10-19. ^ Lavrinc, Damon (October 30, 2008). "SEMA Preview: Ford bringing four F-150s to Sin City". Autoblog. Retrieved 2009-05-14. ^ "2010 Ford F-150 SVT Raptor". Fox News. 2009-09-17. ^ Phillips, Drew (November 4, 2008). "SEMA 2008: Ford F-150 SVT Raptor unveiled in its natural environment". Retrieved 2009-05-14. 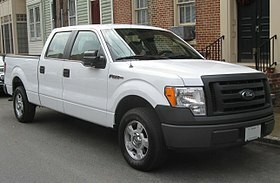 ^ "Ford F-150 SVT Raptor Outsold Honda Ridgeline in April 2011 - PickupTrucks.com News". News.pickuptrucks.com. 2011-05-09. Retrieved 2011-10-23. ^ Phillips, Drew (November 4, 2008). "SEMA 2008: SVT Raptor R race truck to enter Baja 1000". Autoblog. Retrieved 2009-05-14. ^ Abuelsamid, Sam (2010-08-12). "2011 Ford F150 SVT Raptor drops base engine, gets standard 6.2L V8 — Autoblog". Autoblog.com. Retrieved 2011-01-04. ^ "F-150 SVT Raptor Gets A Torsen Front Diff For 2012 | What's New Blog & Opinions at Four Wheeler Magazine". Blogs.fourwheeler.com. 2011-10-01. Retrieved 2011-10-23. ^ "Review: Ford SVT Raptor". The Truth About Cars. Retrieved 2011-10-23. ^ "2017 Ford Raptor EcoBeast - Gear Heads". Gearheads. 2015-01-12. Retrieved 2016-07-20. ^ "Build Your 2011 Ford F-150". Bp2.ford.com. Retrieved 2011-10-23. This page was last edited on 8 April 2019, at 12:20 (UTC).